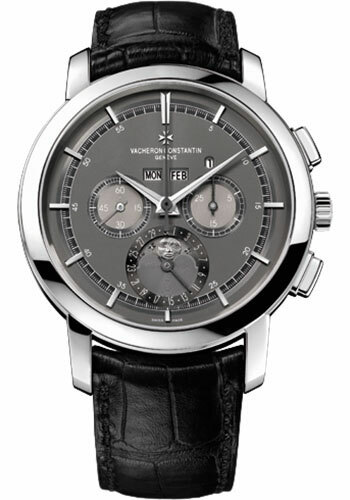 43mm platinum 950 case, transparent sapphire glass back, slate-colored opaline dial, manual-winding 1141 QP movement with hours, minutes, small second, perpetual calendar (hand-type calendar, day of the week, month, leap year, moon phases), and chronograph with 30-minute counter, approximately 48 hours of power reserve, Mississippi alligator strap with diamond-set folding buckle. Water resistant to 30 meters. 43mm platinum 950 case, transparent sapphire glass back, silvered opaline dial, manual-winding 1141 QP movement with hours, minutes, small second, perpetual calendar (hand-type calendar, day of the week, month, leap year, moon phases), and chronograph with 30-minute counter, approximately 48 hours of power reserve, Mississippi alligator strap with diamond-set folding buckle. Water resistant to 30 meters. 43mm 18K pink gold case, transparent sapphire crystal back, silvered opaline dial, manual winding 1141 QP movement with chronograph function, perpetual calendar, and moon phase, approximately 48 hours of power reserve, brown alligator leather strap with 18K pink gold folding buckle. Water resistant to 30 meters. 43.00 mm platinum 950 case, 12.94 mm thick, transparent sapphire back, black dial, Caliber 1142 QP manual-winding movement with day of the week in aperture, minutes, leap year, column-wheel chronograph with 30-minute counter, perpetual calendar, moon phase, month in aperture, small seconds at 9 o'clock, hand-type date, hours, approximately 48 hours of power reserve, black alligator Mississippiensis strap, platinum 950 deployant buckle. Water resistant to 3 bar. delivered with a corrector pen. 43.00 mm 18K 5N pink gold case, 12.94 mm thick, transparent sapphire back, silver dial, Caliber 1142 QP manual-winding movement with day of the week in aperture, minutes, leap year, column-wheel chronograph with 30-minute counter, perpetual calendar, moon phase, month in aperture, small seconds at 9 o'clock, hand-type date, hours, approximately 48 hours of power reserve, dark brown alligator Mississippiensis strap, 18K 5N pink gold deployant buckle. Water resistant to 3 bar. delivered with a corrector pen.